Confronted with the Fujiwara conspiracy to banish him to Dazaifu, Michizane wrote the following poem in front of the ume trees at Kobaidono, the Michizane residence in Kyoto, just before he departed on the journey. When the east wind blows, loose your fragrance, for even without their master, ume blossoms should never forget Spring. There is a well known legend, the Tobiume Densetsu, which has it that out of their yearning, the ume trees flew all the way to Dazaifu in a single night, before Michizane even arrived there, to lay down new roots and release their fragrance for their master. As that famous poem shows, Michizane had an extraordinary love for ume blossom. Kitano-Tenmangu has about 1,500 ume trees of more than 50 types spread over the approximately 6.6 hectares of the shrine grounds, and today it is the most famous ume viewing spot in Kyoto. 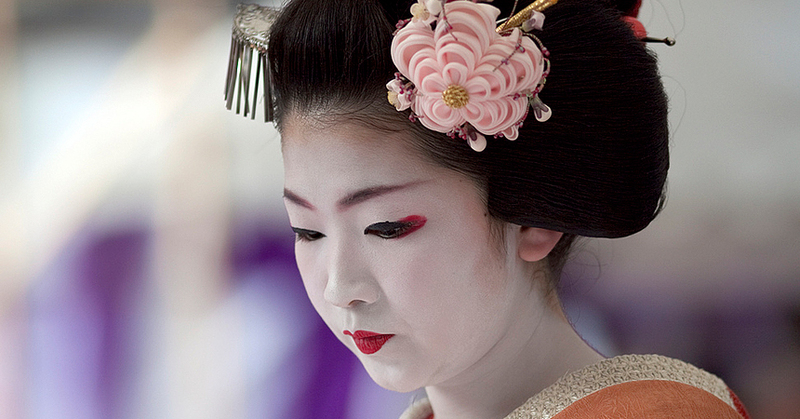 February 25th is the day of Michizane’s death, and the Baika-sai Ume Blossom Festival is held on this day every year. 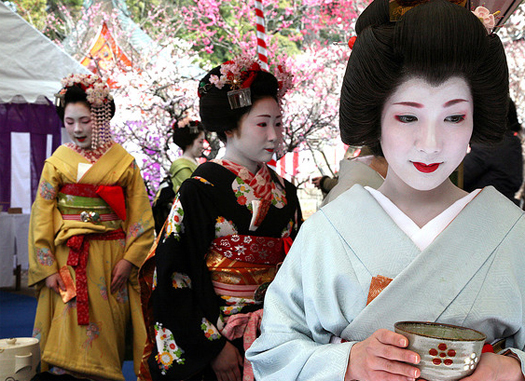 At the festival, always bustling with visitors, geisha from the Kamishichiken district of Kyoto brew tea in an outdoor tea ceremony amid the strong fragrance of the ume blossom. The best time to view the blossoms is the period from the end of February until the middle of March, when ume trees with either red or white blossoms, and both single and double-flowered blossoms fill the garden with their sweet fragrance.